Yanapuma Foundation and Spanish School! Spanish School for Children and their parents!
. . . Amazon, Andes, Pacific coast & the Galapagos Islands. Learn Spanish in Quito or Cuenca! Explore the Wonders of Ecuador! Our travel agency can make all your local arrangements! and cultural programs and "Study and Travel" programs. Volunteer while you learn the Spanish language. Share our Passion for Spanish! Yanapuma is the only professional Spanish school using "Communicative Language Teaching" (CLT) in Ecuador. We teach you relevant Spanish communication in classes that are engaging and productive! Our qualified staff and teachers offer courses for students and volunteers at all levels and ages in elegant and comfortable historic buildings in our Spanish language schools in Quito and Cuenca. We offer accommodation for our language students with welcoming local host families, as well as with hostels and hotels, from backpacker to luxury style. We provide a secure and friendly base from where you can explore these vibrant and historic, colonial cities and our in-house travel agency True Ecuador Travel will help you make all your travel plans. Explore the rich cultural and natural heritage of Ecuador, including the Galapagos Islands on our "Study and Travel" programs while you learn to speak the Spanish language! Help to support the work of Yanapuma Foundation in promoting sustainable development among indigenous and marginalized communities in Ecuador. UNBEATABLE PRICES - GROUP CLASSES FROM $6 PER HOUR! - INDIVIDUAL CLASSES $9 PER HOUR! Take advantage of our Spring Specials to take your Spanish skills to the next level! Since 2006 we have taught thousands of students using the highest standards and materials, offering the very best in Spanish language tuition based on the recommendations of Spain's "Instituto Cervantes." Our unique-in-Ecuador "Communicative Language Teaching" method encourages you to communicate effectively from the start, and with our use of technology in the classroom makes your Spanish classes much more engaging and productive! Find out more about Quito. Find out more about Cuenca. SEE OUR OFFERS FOR 2019! Study and Travel & More! Our "Study and Travel" programs in Ecuador are a popular way of combining Spanish classes with exploration of Ecuador with a teacher. Visit the Amazon rainforest, the Andean sierra, the Pacific coast and the Galapagos Islands. Go to "Study Travel" programs. We also offer two Medical Spanish programs for doctors, students and health practitioners with an optional practicum in Quito. In addition we offer volunteer programs in Quito and Cuenca either with or without Spanish classes, and all around Ecuador. Students of all ages study Spanish with us - from 6 to 76! 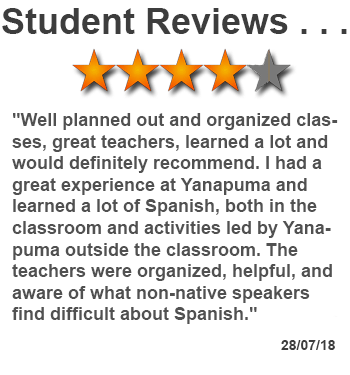 Our Cuenca school has many retired students regularly taking classes, and our Quito school also receives retired and older adventurers looking to learn or improve their Spanish. Our methods adapt to any age of learner and we have programs and materials for children from as young as 5-years-old to learn Spanish with our well-prepared teachers. Standard Immersion Spanish - 3 hours per day in the afternoon, from 3 to 6 pm. Volunteers often take these classes as most volunteering takes place in the mornings. Intensive Immersion Spanish - 4 hours per day in the morning from 9 am to 1 pm. Couples or Friends - Classes for a couple or friends traveling together, at any language level, 4 hours in the morning or irregular hours in the afternoon. These programs include 20 hours (4 hours per day) of small group classes in the mornings, plus excursions to places of cultural and historical interest around these cities in the afternoons with a teacher. This is a great way to combine learning Spanish with tourism and culture. You can elect individual classes instead of small-group classes if you wish. Combine your Spanish language classes with volunteering in a local project in the mornings. Classes are 3 hours in the afternoons from 3 to 6 pm, leaving you plenty of time to return from volunteering to the school and have lunch before starting class. These exciting programs combine Spanish classes with exploration of some of the incredible diversity of Ecuador. Each of the 10 programs explores a different part of the country. While some involve spending a week in an Amazon rainforest or cloudforest lodge, others move along a pre-determined route. True Ecuador Travel - Yanapuma's brand new travel agency for all your Ecuador adventure! At Yanapuma Foundation and Spanish School we have become increasingly involved over the past few years with organizing a variety of extra activities for our students and volunteers, from Amazon and Galapagos tours, climbing volcanos, exploring Ecuador by train, staying in luxury haciendas and lodges, white-water rafting and other sports, and more. So we decided to launch our own travel agency as a limited company in Ecuador to be able to offer all the security and guarantees that our students and volunteers would expect. An additional advantage is that we can negotiate better deals for flights, tours, and other events. So whatever your plans for your time in Ecuador, let us know and we will be happy to offer our guidance and help through True Ecuador Travel. We can also book activities throughouth Peru - Inca Trail, visits to indigenous communities, Lake Titicaca, adn more. Just like the Spanish schools, True Ecuador Travel will help to further our mission as an NGO by providing resources for our development projects and seeking ways to connect persons from developed and developing countries for mutual learning and benefit. Volunteering is a great way to practice the Spanish that you are learning in your classes. It is also a great way to connect with the people and culture of Ecuador. Our volunteer coordinators will be happy to recommend suitable projects for you, either in Quito or Cuenca while you study the Spanish language, or in any of the 25 or so projects that we collaborate with around Ecuador. So whether you want to work with children in a daycare or school, street children, animal rescue, environmental or reforestation projects, clinics and health centers, community development, or organic farming, we will have something right for you. Profits from our School in Quito help fund the work of Yanapuma Foundation, a non-profit organization dedicated to promoting sustainable practices in marginalized communities throughout Ecuador. To find out more please read our latest newsletter. We have been carrying out sustainable development projects with indigenous and marginalized communities in Ecuador since 2006, funding scholarships for disadvantaged children to study at high school, ecological sanitation, sustainable cacao production, health and nutrition initiatives, reforestation and environmental protection, and more. Your support as a student contributes directly to improving the lives of marginal communities in Ecuador! You can read more about all these activities on our foundation website. Yanapuma offers a variety of accommodation options for our students in Quito and Cuenca. We recommend a homestay with a local host family as the best way to immerse yourself in the Spanish language. We work with a number of welcoming and sociable families in all three cities, and we will be glad to help you organize a homestay while you take your Spanish course or volunteer with us. In addition we can offer hotel and hostel options according to your budget and preferences. Through our travel agency we can most often beat the prices for hotels that you can find online! To learn more, please go to our accommodation page. Yanapuma is one of the professional language Schools in Ecuador, and a member of the AECEE (Ecuadorian Association of Spanish Language Centers) You can see our other professional education affiliations below. We are the ONLY school in Ecuador that uses the "Communicative Teaching Methodology". Our classes use material from every day life and encourage students to communicate from the start. Grammar is introduced as a support for these activities rather than as an end in itself. This makes our classes relevant to your learning goals, and much more engaging and productive. We strive for continual improvement in order to offer the best experience - academically and socially - to our students. Our teachers undergo ongoing academic training. Our prices are among the lowest for professional language lessons in Ecuador. Our methods are based on the renowned Cervantes Institute of Spain, and we use the Common European Framework of Reference for Languages and ACTFL standards for US students. See how our students rate us in their evaluation forms! In addition, we welcome partnerships with professional organizations, universities, high schools and other educational institutions. Here are some that we work with.
. . . is not only the dedication to professional Spanish language tuition and methodological innovation, but also the mission of Yanapuma Foundation to promote sustainable development among indigenous and marginalized communities in Ecuador and Peru.